At one point or another we’ve all been to a venue to watch a live singer. Some are good, some are bad but they all share the same struggle:how to make a name for themselves in the Second Life Music scene. There are live performers that everyone knows if you follow the music scene even a little. Performers that are guaranteed to draw a crowd to any venue they perform, then there are the artists who are just making a name for themselves. They celebrate the small victories, like making it to 500 members in there fan group. They seemingly work harder for their fans, taking the time to interact on a more personal level with them. These little touches make for devoted fans as the artist rises through the ranks of the music scene. I’ve followed one such artist, named Wolfie Starfire. She is an incredible vocalist with a surprising talent that easily makes her stand out in the field of other Second Life artists. I quickly became a fan myself. I took some time to attend several of her shows at various venues, just to make sure the talent I heard wasn’t a fluke and was surprised to hear her repeat the same near flawless performance with both cover songs and originals she had written. I became curious as to why her name wasn’t more well known. This led me to interview her manager, Laurie Alexis Co-Owner of the Keys Management group as well as The Keys music venue and resort to find out what it took for a performer to make it big. SLE: Did Wolfie come to Keys Management Group or did you discover her? Laurie: Wolfie was recommended to us by our host manager and a venue owner, so we set up an audition for her. She blew us away, we were not expecting her level of talent. SLE:What is the most difficult aspect of bringing a new artist into the SL live music scene? Laurie: Keeping them patient, everyone wants instant success. But that takes time, they must develop a following and grow their group. It really takes a long time before they get to where they want to be.. So it is my job to keep them grounded and to not let them get too discouraged. I also try to help them refine things to help get them to where they need to be. Wolfie has been amazing to work with. I constantly challenge her and she always says, ok let me see what i can do. And an hour later she has it. SLE: Is there an average amount of time before an artist to become successful, or does it vary depending on the performer? Laurie: It depends on the performer, Wolfie already had some experience singing in SL before, so her time was short. Usually it takes around a year or so. SLE:At what point is an artist considered successful? Is there a specific amount of people in their group opr a certain venue they play at, or maybe something else? Laurie: It depends on what the performer wants. We work for the performer, so their idea of successful may be one show a month, or they may want 10 shows a week with 30+ people at every show. We try to provide them what they are seeking. I also had the opportunity to interview Wolfie herself, to get her take on what it takes to become a star in the Second Life music scene and what that means to her. SLE: First off...you have an amazing voice, and I know you have released an album, so when did you start singing? Wolfie: I've been singing since i could talk actually. The first thing I remember was a car commercial on the radio actually. I was in the backseat started singing and my Dad turned around and was like is that you? Professionally I've been singing since I was in middle school. Did shows and such. SLE: Do you feel that you are a successful artist in the SL music scene, and what is your benchmark for success here? Wolfie: Well, what really defines success here in SL? I mean I've gotten to meet so many wonderful performers on here that have said so many nice things about my singing it really warms my heart. I guess if the others really take notice of you that's a start.Getting to sing at so many venues here in sl and the exposure is amazing. I've met people all around the world thanks to Second Life. SLE: Is there more in SL, musically, that you want to achieve? Wolfie: Well here in SL there are many performers that meet up in rl at jam sessions and that is something I'd really love to do. Because it's all about connections. 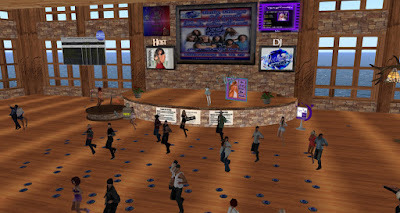 I'd love to do more duel streams and get more connected with social media here in second life. SLE:Are the connections made in SL the driving force behind your SL music career? Wolfie: No, my fans and friends are. Without them I wouldn't be doing what I do here in SL. They are the ones that push me and encourage me to do more things in sl and rl. because of my singing in sl it gave me more courage to attempt things in rl. Connections are more work driven. musicians certainly influence my performances here. 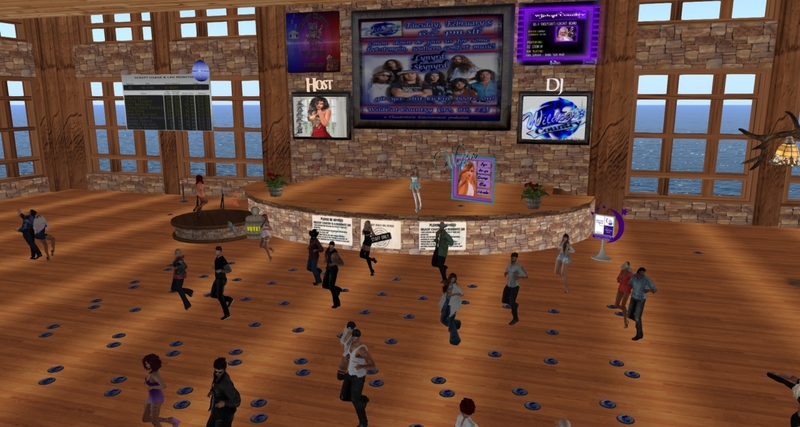 We all look at each other and take bits and pieces from each other in order to grow in sl. Many performers here inspire my shows; Nina Bing, Lark Bowen, and Rara. SLE: Do you feel that having management has helped you achieve the level of success that you have? Wolfie: Oh gosh yes! I mean i started out by myself and it was a struggle. It wasn't until I met key west that they helped me get organized and got me the connections needed to kick start my career here. From the perspective of the artist and the management it would seem that success is defined differently, every artist has their own definition and can find success with each new accomplishment, always striving for that next achievement. Wolfie is an up and coming star in the SL music scene and one to watch for sure.